1993–1994 Post Doctoral, The MIT Energy Laboratory, Massachusetts Institute of Technology (MIT), USA. 1993 Doctor in Chemical Engineering, University of Groningen (RuG), The Netherlands. 1981 Master of Engineering, Energy Technology, Asian Institute of Technology (AIT), Bangkok, Thailand. 1978 Sarjana Teknik Kimia (Chemical Engineer), Chemical Engineering, Institut Teknologi Bandung (ITB), Indonesia. 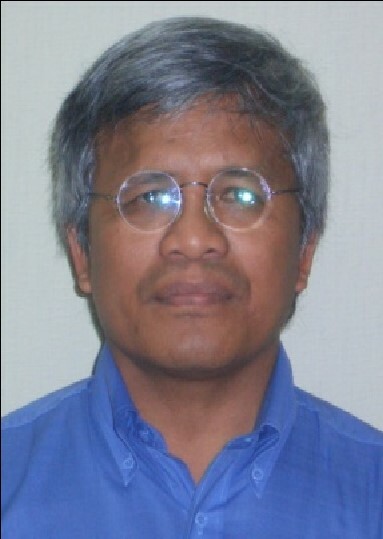 2006-Present Associate Professor, Department of Bioengineering, School of Life Sciences and Technology, Institut Teknologi Bandung. 2005-Present Visiting Professor, Department of Chemical Engineering, University of Groningen (RuG), The Netherlands. 2001-2005 Associate Professor, Department of Chemical Engineering, Faculty of Industrial Technology, Institut Teknologi Bandung. 2005-2007 Director, Biotechnology Research Center, Institut Teknologi Bandung. 2001-2003 Director of University Library, Institut Teknologi Bandung. Institute for Research, Institut Teknologi Bandung. 2012-Present Scientific Advisor, PT. Bioproduk Solusi Nusantara (for Integrated Bio-based Chemical Industries). 2007-Present Scientific Advisor, NOVA Group – Khartoum, Sudan (for Biobased Industries Project in Sudan). 1995-Present Academic Representative for the University of Groningen in Indonesia. 1994-2004 Member of The Combustion Institute. 1994-2004 Member of American Chemical Society. 1984-2004 Member of American Institute of Chemical Engineers. Reutealis trisperma (Kemiri Sunan), Pandanus conoideus (Buah Merah) and Pandanus julianetti (Kelapa Gunung) using biorefinery concept for production of biofuels and high added value bioproducts. 2008-Present Present Valorisation of Micro algae using biorefinery concept for production of biofuels and bioproducts. 2007-Present Valorisation of cassava using biorefinery concept for production of biofuels and high added value bioproducts. 2004-Present Valorisation of Jatropha curcas using biorefinery concept for production of biofules and high added value bioproducts. 1984-Present Valorisation of Rice Plant using biorefinery concept for production of biofuels and high added value bioproducts. Author and co-author of more than 100 full-length publications in scientific journals, conference and seminars papers in the field of process development related to biobased products : bioenergy and biochemicals. M. Yusuf Abduh, R. Manurung, A. Faustina, E. Affanda and I. R.H. Siregar. 2017. Bioconversion of Pandanus tectorius using black soldier fly larvae for the production of edible oil.and protein-rich biomass’. Journal of Entomology and Zoology Studies 5 803-809. M. Y. Abduh, Manurung, R., H.J. Heeres. 2016. The influence of storage time on relevant product properties of rubber seed oil and rubber seed oil ethyl esters. Sus. Chem. Process. Manurung, R., Ateng Supriatna, Rizkita R Esyanthi and Ramadhani E Putra. 2016. Bioconversion of Rice straw waste by black soldier fly larvae (Hermetia illucens L.) : Optimal feed rate for biomass production. Journal of Entomology and Zoology Studies. A. Supriyatna, Manurung, R., R.R. Esyanti and R. Eka Putra. 2016. Growth of black soldier larvae fed on cassava peel wastes, An agriculture waste. Journal of Entomology and Zoology Studies. A. Supriyatna, Manurung, R., R.R. Esyanti and R. Eka Putra. 2016. ‘Growth of black soldier larvae fed on cassava peel wastes, An agriculture waste’, Journal of Entomology and Zoology Studies 4 (2016) 161-165. Abduh, M.Y., Martínez, A.F., Kloekhorst, A., Manurung, R., Heeres, H.J. 2016. Experimental and modelling studies on continuous synthesis and refining of biodiesel in a dedicated bench scale unit using centrifugal contactor separator technology. European Journal of Lipid Science and Technology. Abduh, M.Y., Rasrendra, C.B., Subroto, E., Manurung, R., Heeres, H.J. 2016. Experimental and modelling studies on the solvent assisted hydraulic pressing of dehulled rubber seeds. 16 Industrial Crops and Products. Manurung, R., Widiana, A., Taufikurahman., Limin, S.H. 2015. Composition of Leaf Oil of Gelam (M. leucadendra (L.)L.) Growing in Various Peat Swamp Regions of Central Kalimantan Indonesia. Advances in Natural And Applied Sciences. Manurung, R., Abduh, MY., Ariono, D. 2015. Solvent assisted hydraulic pressing of Sterculia Foetida. Eur. J. Sci. Res. Widiana, A., Taufikurahman., Limin, S.H., Manurung, R. 2015. The Potential of Gelam Leaves as Non-timber Product of the Trees for reforestation of the Degraded Peatland in Central Kalimantan. 2015 Advances in Environmental Biology 9(2), 13-17. 2015. ISSN Print 1995-0756.Online ISSN: 1998-1066. SJR 0.213. SNIP 0.414. E. Subroto, Manurung, R., H. J.Heeres, and A. A. Broekhuis. 2015. ‘Mechanical extraction of oil from Jatropha curcas L. kernel: Effect of processing parameters’, Industrial Crops and Products 63 303–310. E. Subroto, Manurung, R., H. J.Heeres, and A. A. Broekhuis. 2015. ‘Optimization of mechanical oil extraction from Jatropha curcas L. kernel using response surface method’, Industrial Crops and Products 63 294–302. Subroto, E., Manurung, R., Heeres, H.J., Broekhuis, A.A. 2015. Mechanical extraction of oil from Jatropha curcas L. kernel: Effect of processing parameters. Industrial Crops and Products. Abduh, M.Y., Iqbal, M., Picchioni, F., Manurung, R., Heeres, H.J. 2015. Synthesis and properties of cross-linked polymers from epoxidized rubber seed oil and triethylenetetramine. Journal of Applied Polymer Science. Manurung, R., Melinda, R., Abduh, M.Y., Widiana, A., Sugorc, I., Suheryadi, D. 2015. Potential use of lemongrass (cymbopogon winterianus) residue as dairy cow feed. Pakistan Journal of Nutrition. M.Yusuf Abduh, W. van Ulden, H. van de Bovenkamp, Teddy Buntara, F. Picchioni, Manurung, R., and Hero J. Heeres. 2014. ‘Synthesis and reﬁning of sun ﬂower biodiesel in a cascade of continuous centrifugal contactor separators’, Eur. J. Lipid Sci. Technol. 2014, 116, 0000 –0000. Widiana, A., Taufikurahman, Limin, S.H., Hernaman, I., Manurung, R. 2014. Utilization of solid residue melaleuca cajuputi powell leaves as cattle feed. Pakistan Journal of Nutrition. Louis Daniel, Carolus B. Rasrendra , Arjan Kloekhorst, Antonius A. Broekhuis, Manurung, R., and Hero J. Heeres. 2014. ‘Application of metal triflate catalysts for the transesterification of Jatropha curcas L. oil with methanol and higher alcohols.’, J Am Oil Chem Soc (2014) 91:325–336. Erna Subroto, Manurung, R., Hero J. Heeres and Antonius A. Broekhuis. 2013. ‘Screening of antioxidants as stabilisers for Jatropha curcas L. oil’, Eur. J. Lipid Sci. Technol. 2013, 115, 909–920. M. Yusuf Abduh, Wouter van Ulden,, Vijay Kalpoe, H. van de Bovenkamp, Manurung, R., and Hero J. Heeres. 2013. ‘Biodiesel synthesis from Jatropha curcas L. oil and ethanol in a continuous centrifugal contactor separator’, Eur. J. Lipid Sci. Technol. 2013, 115, 123–131. Manurung, R., L.Daniel,; H., Bovenkamp, T. Buntara, S. Maemunah, G. Kraai, H. Makertihartha, A.A. Broekhuis, and H.J. Heeres. 2012. ‘Chemical Modifications of Sterculia foetida L. Oil to Branched Ester Derivatives’, European Journal of Lipid Science and Technology’, 2012, 114, 31–48. Louis Daniel, Agnes R. Ardiyantia, Boelo Schuur, Manurung, R., Antonius A. Broekhuis, Hero J. Heeres. 2011. ‘Synthesis and Properties of Highly Branched Jatropha curcas L. Oil Derivatives’, European Journal of Lipid Science and Technology’, 2011, 113, 18–30. Manurung, R., E.J.Leijenhorst, D.A.Z. Wever, J.Wildschut, R.H. Venderbosch, H.Hidayat, J.E.G. van Dam, A.A. Broekhuis, H.J. Heeres. 2009. ‘Valorisation of the Jatropha curcas plant using the birefinery concept : nut shell conversion to a second generation biofuel by fast pyrolysis’, Elsevier : Food and Bioproducts Processing 87 : 187 – 196. L. Junistia, A.K. Sugih, Manurung, R., F. Picchioni, L.P.B.M. Janssen, H.J. Heeres. 2009. ‘Experimental and modeling studies on the synthesis and properties of higher fatty esters of corn starch’, Starch / Sarke 61 : 69 -80. Manurung, R. 2009. Jatropha curcas Oil storage and Shelf life. The Jatropha World Asia 2009 Kuala Lumpur, February 16-17, 2009. L. Junistia, A.K. Sugih, Manurung, R., F. Picchioni, L.P.B.M. Janssen, H.J. Heeres. 2008. ‘Synthesis of higher fatty acid starch esters using vinyl laurate and stearate as reactants’, Starch / Starke 60 : 667 -675. B. Girisuta, B. Danon, Manurung, R., L.P.B.M. Jansens; H.J. Heeres. 2008. ‘Experimental and Kinetic modeling studies on the acid-catalyzed hydrolysis of the water hyacinth plant to levulinic acid’, Elsevier : Bioresource Technology 99 (2008) : 8367 – 8375. F.H. Mahfud, I. Melien-Cabrera, Manurung, R., H.J.Heeres. 2007. ‘Biomass to fuels: Upgrading of flash pyrolysis oil by reactive distillation using high boiling alcohol and acid catalysts’. Trans IChemE, Part B, Process Safety and Environmental Protection, 2007, 85(B5):466472. Manurung, R. 2006. Minyak Jarak Pagar Murni, Bahan Bakar Pengganti BBM. Seminar Nasional Pengembangan dan Pemanfaatan Jarak Pagar (Jatropha curcas Linn.) Sebagai Bio-Energi di Indonesia. Jakarta, February 25, 2006. • Biomass conversion using insect black soldier – Hermetia illucens (pilot plant). • Sustainable Agriculture – Bioindustry using Integrated Biorefinery concept (demonstration plant). • Combination of Mycorrhyza and Jatropha Press Cake as Biofertilizer (pilot plant). • Technology for Extracting, Purifying and Stabilizing Vegetable Oil ( pilot plant). •In situ Direct Hydrolysis of Palm Oil (Indonesian – Patent Filling). • Continuous bio-diesel production system (Indonesian – Patent). • Small – Medium Scale (5 – 10 tons/day) Glucose plant (commercially applied). • Charcoal and Activated Carbon Industries (Activated Car from grams to kilograms to tons), 1991-present, (commercially operated). • Rice husk gasification, 1980 – present, (commercially operated).